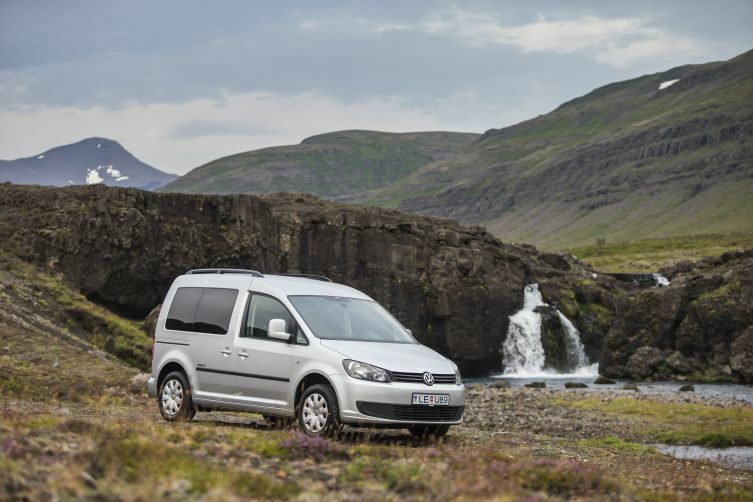 Our campervan is the perfect vehicle to travel around Iceland. Our mini camper can sleep 2 and seat up to 5 people plus luggage. It comes fully equipped with a comfortable double bed, stove, fridge and sink with running water: Basicly everything you need for cooking, eating and sleeping is included. So no need to book a hotel, guesthouse or hostel throughout your holiday in Iceland! In case you’re planning to travel together 3 or more we offer tents to sleep in for hire for a reasonable price. VW Caddy has a very low fuel consumption (6,3 L/100 - 42MPG) so you can not find a smarter car to travel all around our adventure island. Our camper van is perfect for couples, families or sharing withe mates… Enjoy the benefits of camping in comfort, for less! Our campervans are average 2 years old and all very well maintained. We will pick you up at Keflavík International Airport immediately when your flight has arrived and you have collected your luggage. We will be waiting for you in the arrival hall with the FairCar logo on a white board. Our representative arrives 25 minutes after landing and wait for 30 minutes (given you have provided the correct flight information). If customers do not provide us with flight number, we will wait for their call and then go to the airport. Vehicle is available upon request.